Have you noticed a shift in design to fit more into less? Britain’s homes are continuing to be squeezed into smaller spaces, with “micro homes” becoming a popular housing choice. The number of properties under 37sqm has increased by 60% since 2013, whilst new builds are currently averaging 4sqm below government guidelines. The development of smaller living spaces means it’s time to think differently about how to make the most out of every inch available. It has driven demand for clever, innovative storage & fixing solutions, which is what we aim to provide you. Gone are the days where you have to compromise style for functionality. 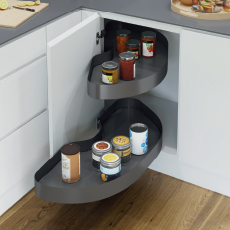 From two-way runners which gives a wider scope when positioning drawers into kitchen design, to clever bin configurations that keep them out of sight to maximise floor space. A recent article in The Guardian identified that that kitchens in new-build homes are 13% smaller than those build in the 1960’s. 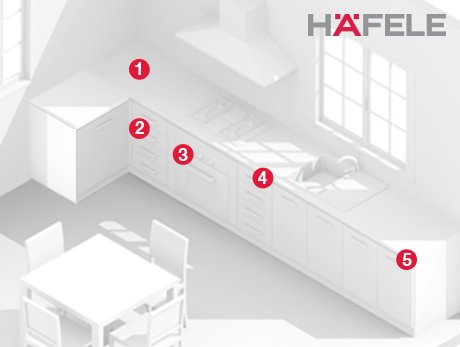 All of the solutions listed here are available from Häfele and maximise space even in the most challenging of living spaces. 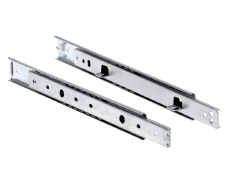 Gola profiles (126.37.891) – When every inch matters, using Gola profiles can ensure handles are not protruding on cabinetry. View the product here. 1. 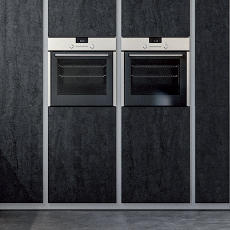 Ninka Qanto (542.72.421) – A complete pre-assembled cabinet that rises from a corner cabinet at the touch of a button. 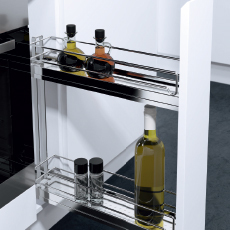 An ideal way to make the most of cabinet space in an efficient and ergonomic way. Find out more here. 4. Accuride 2002 Drawer Runners (422.15.310) travel in both directions. 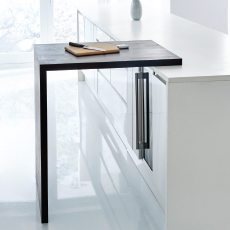 Drawers can be accessed from both directions, which is perfect when space is at a premium. View here. 6. 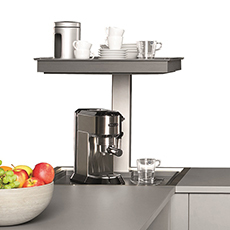 The Table Top Swivel Fitting Set (646.31.000) allows one piece of furniture to have two functions; sideboard and table, without losing access to the storage space inside the cabinet. Order now.